On Saturday 27th November Oldham Community Leisure, Oldham Athletic Community Trust, Street Games and Community 1st Oldham are bringing a day of free fun activities to Oldham Town Centre to raise awareness of health and sport projects across the borough. 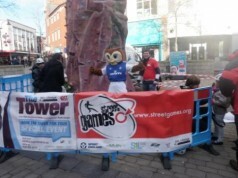 The event marks the official launch of Street Games in Oldham. StreetGames is a groundbreaking national charity which develops sport with disadvantaged communities and makes sport accessible to young people regardless of their social circumstances. Joint funding from them, Community 1st Oldham and Sport4Life is bringing more opportunities for the young people of Oldham to access sports. More opportunities will follow next year. The day of fun activities will include free climbing on the OCL mobile climbing tower, football demonstrations and keep up competitions from the Kickz and Striker 9 Projects and the Street Cheer Girls will be providing demonstrations. Chaddy the OWL will also be in attendance.